wow great progress dude the background image is really nice and helpful! Could you point out the names of the interfaces you used in those screenshots? If this won't help, send me your interface. New try. It's working fine now. As I've mentioned above, UPX somehow screwed my data in resources, that's why I tried another packer - MPRESS. But as you can see it's less known by anti-viruses. Try to feed your AV with the next attached file It's uncompressed, just zipped. Can you give more specific information on this bug? Because it works fine for me. What interface you have used? What does 'not work' mean? 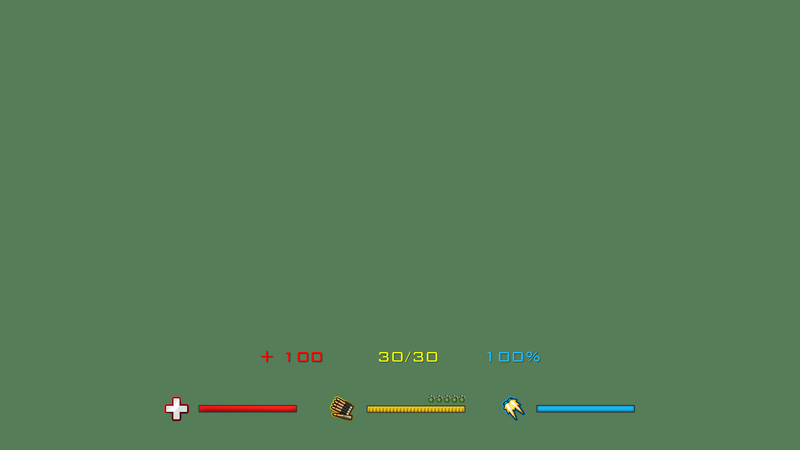 I open intmaker2 click on File -> New Interface -> Name Interface -> Select Health Bar -> Check Text -> Results in no ammo text, "Eg: Invisible, or non existent 100% health status"
1. To install that font you should copy "bgothl.ttf" file from the Soldat folder and paste it into "C:\Windows\Fonts" folder. P.S. That's why I was asking for the screenshot, coz it showed me more information then you did There were not only a "Text" labels missing, Flag counters and Ammo text were missing too. All of them are using same font. Make sure that your firewall allows IntMkr2.exe to access the Internet. Press Ctrl+F1 or use "Settings" menu to show scoreboard & cursors preview. IntMkr2 fails to load 8bit BMP graphics. But there are two BMP files saved with 8bit color depth in default "Interface-gfx" folder (star.bmp & mute.bmp). Soldat loads some graphics from default "Interface-gfx" if there are no such files in the interface folder. And since IntMkr2 can't load 8bit BMPs, there will be no "star" & "mute" icons displayed for some interfaces (while displaying "Scoreboard"). The only simple way to fix it is save "star.bmp" & "mute.bmp" (from "Interface-gfx") with 24bit color depth. I encountered a bug that makes fire-bar invisible on save. The fire-bar is visible in the IntMkr2 itself, but is not shown when opened in Soldat. I tried replacing setup.sif file from another interface and the fire-bar magically appears, so it's not the image's fault. I also tried opening a working interface, saving it in IntMkr2, and opening it in Soldat - the fire-bar disappears. In other words, it doesn't save the setup.sif file properly. I'll look into this on the weekend (I hope). -Unable to move Ping-dot. Even if I move it in IntMkr2 and press save it will only appear on top right corner ingame. -Nades placement is not correct in other resolutions (I use 854x480). It's not placed at the same spot ingame as in IntMkr2. -It would be cool to be able to rotate Team Box. I want it horizontally like a soccer scoreboard. "Ammo Icon" & "Ammo/Reload Amount" & "Ammo Text" (it was a bug) are sharing the same address in a settings file for the visibility flag. That's why you can't hide them separately. "Ammo Icon" & "Ammo/Reload Amount"
"Health Icon" & "Health Amount"
"Jet Icon" & "Jet Amount"
"Fire Icon" & "Fire Amount"
IntMkr2 saves "Ping Dot" coordinates in *.SIF file correctly. You could check it even with MM's Interface Maker. The problem is that Soldat ignores those coordinates (just tested v1.6.6, 1.5.0, 1.4.2). Default "Classic" interface has a "Ping Dot" in a left-mid position, but it shows in right-top corner in-game too. I need more specific information, e.g. in-game & editor screenshots and the interface files you've used. It's not possible with current Soldat's interface system. I couldn't reproduce this bug. If you ever would read this reply, please attach the exact interface you've used with a step-by-step instructions on how to reproduce it. It's a bug in Soldat itself (just tested at v1.5 - 1.7a1). By the way, MM's Interface Maker, after disabling all "visible" flags, shows "Ammo text" only (which is a bug too). In cooperation with urraka we found out that bug with "Ammo Text" actually was in MM's Interface Maker and therefore in my IntMkr2 (since I was using MM's IntMkr to analize .SIF format). Bugs with "TeamBox" text and "Ping Dot" position should be fixed in 1.7 alpha 2. For now, if you need to hide "Ammo text", open setup.SIF with any HEX-editor and change 7th byte from "01" to "00". See screenshot in attachment. - Ammo/reload amount and Ammo text are connected. I can't hide the ammo text not hiding Ammo/reload amount and the opposite too. Is it a issue related to the int maker? - I have noticed that the default 1.7 interface with HD images is messy on your int maker. Planning updates? "Ammo Icon" & "Ammo/Reload Amount" are sharing the same address in a settings file for the visibility flag. That's why you can't hide them separately. I'm working on the updated version. So looking forward to it! Thanks for your work! I have felt ashamed after receiving a notification email about this topic been stickied... because I did not release new version of IntMkr yet. Few people from #soldat.devs already had a chance to test dev. builds of new version, so I fixed some critical bugs thanks to their feedback. I'm still not happy with a current state of development (lack of some urgent features and improvements). I decided to publish a latest dev. version, since there may be some activity in modding community now but it's not possible to use 0.1.2 version to work on HD interfaces. This software is provided "AS-IS", without any express or implied warranty. In no event shall the author be held liable for any damages arising from the use of this software. Any updates soon? It's a very cool program and I need to work on my interface soon. If you need me to bugreport I will gladly help out. I have no updates yet, sry. I can not use it, but would like to learn..
SyavX doesn't seem online since a short while but maybe someone who uses this app (not me) will be that bored to record an instruction video for you and community. I recommend CamStudio for such purposes. [BUG] I'm editing a new interface using this 0.2.0 version but it is not saving changes anymore. I'm stuck because the software can't save the changes. I have to create a new interface and do everything again... although i'm getting stuck again and again. SyavX, you could also add a Save As option. Page created in 0.274 seconds with 19 queries.